The Staff Gateway is the CIT Staff extranet application. Staff email allows you to access staff email from outside of the institute. HR/Expenses is an online self-service facility that provides access to personal detail information, payroll details such as pay slips, expense forms submitted and their status, and e-Recruitment details online. It is referred to by many staff as CORE/CORE Portal. Finance Website to access information such as Leave of Absence forms, subsistence rates, motor rates and information about purchasing etc. Password Reset allows you to change your password. Remote Access allows you access to the Staff Gateway remotely. You can also have access to the H drive. Web for Faculty (Banner) to access the student information system. Canvas the institute's Virtual Learning Environment. Here class notes can be stored, assessments can be uploaded, student announcements can be made and communication with students can occur. Timetables to access your timetable or view a colleague’s timetable. You can see the times a lecture takes place, the lecturer delivering the class and the room number where the class takes place. You can also check if a particular room is available at a particular time. Course Builder is a curriculum development tool that the institute uses when developing new modules and courses. Staff Search is useful if you wish to search for a particular staff member in the institute. 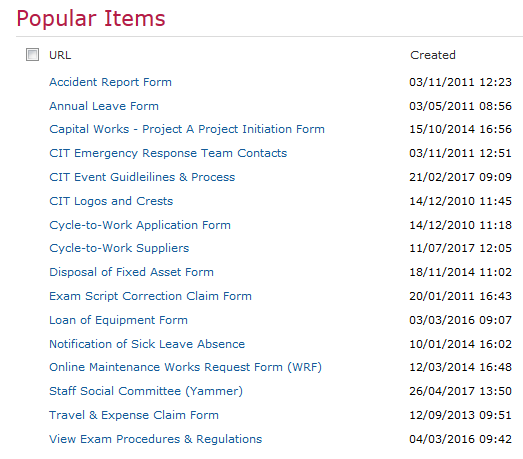 The gateway also has a “Popular Items” section which includes frequently accessed forms and documents and an “I want to…” section which includes frequently performed tasks.